I slept. And slept. And slept some more. I had hardly slept at all on Friday night – woke up in the middle of the night and my mouth was in horrible pain, and I couldn’t get back to sleep. So between the lack of sleep, the drain of being in pain, the drain of my body fighting off an infection, and the painkillers – I passed out and cold have easily slept all day long. Kay hunted through the hotel breakfast options for me, but it was unsatisfactory – and I was already in the period in which I couldn’t eat because the antibiotics had to be taken on an empty stomach. So off we went, heading south on I-5. 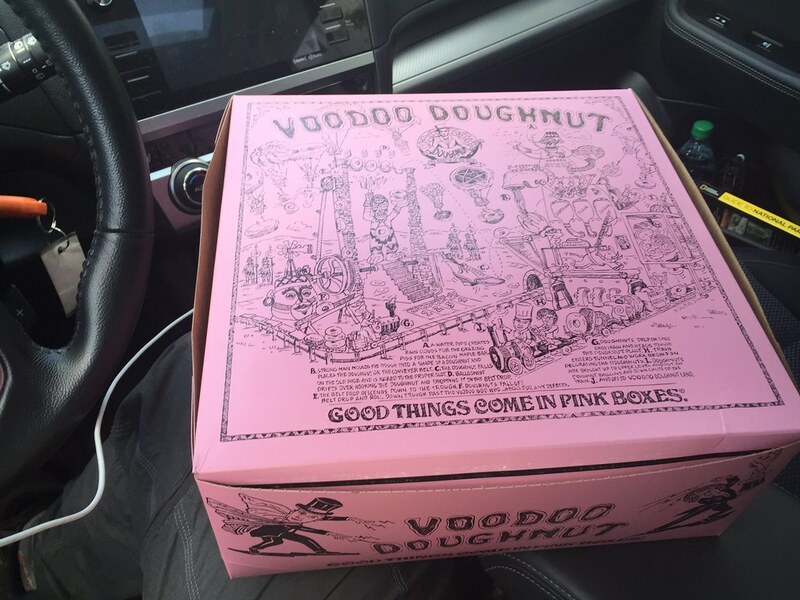 My original plan was for us to stop at Voodoo Doughnuts in Portland, Oregon, because I’d heard so much about it and had always wanted to try it. But after not eating much the day before, not eating anything that morning, and just being in pain – I was crashed by 11am. My head was throbbing (badly) and I said to Kay at one point that I just wanted to lie down, and be out of the car, and I felt like crying. This is not the way you want to feel on vacation, 3,000 miles from home, FYI. He took over the task of hunting soft food for me, as I was less than a half hour away from being able to eat again, so we found ourselves at a small family-run diner in the middle of nowhere. It was so small that the bathroom was outside and around the back. The novelty might have been amusing, if I hadn’t been in so much pain. He got me runny eggs (sunny side up) and some mashed potatoes, with gravy on the side. It took a while for the food to come out, as it was apparently the only restaurant in town, but when it did, it tasted like the best meal EVAR to me. I ate it ALL up. And then I took pain pills, as I had food in my stomach and I could. Thus fortified, we headed back down the road toward Portland, and I was improved enough to face dealing with the line at Voodoo and hunting down a coffee shop. 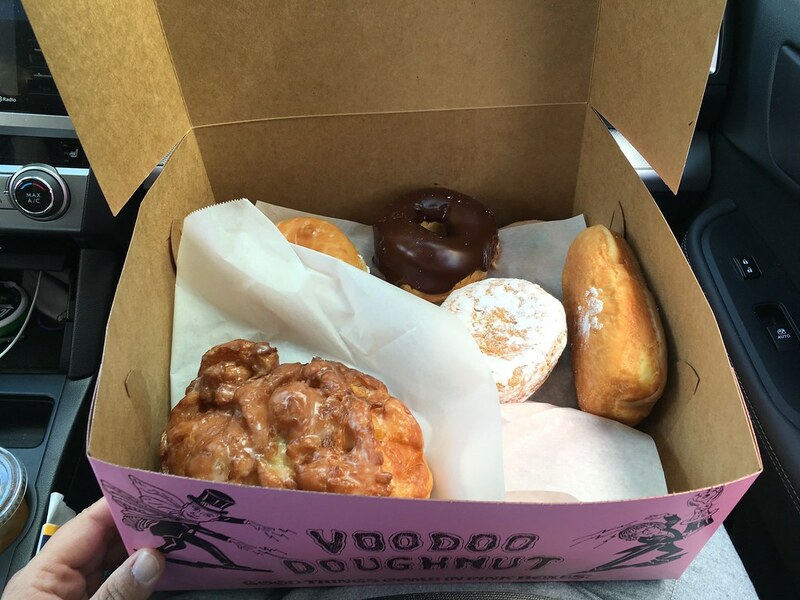 I unfortunately forgot that Voodoo was cash only, and Kay had wandered off to walk the dogs, so I got the only thing the $18 in my wallet could get me – the Voodoo Dozen (they pick them, but it doesn’t include any of the really fancy doughnuts) and an apple fritter. I was a little disappointed not to get any of the fancy ones, but I was still headachey and wasn’t up to waiting in the 20-minute line again with more cash. Donuts acquired, we headed to Heart Coffee Roasters, where I enjoyed my second-best latte on the West Coast. (Sorry, Storyville in Seattle was still better… but Heart, you were damn good.) Kay and I proceeded to feast on donuts and delicious coffee and tea beverages as we headed down the I-5 some more. At one point, we saw a giant pure white dust cloud. Kay thought it must be some sort of industrial output. We were so curious as to what it was, and so bored, that we got off the interstate to check it out. 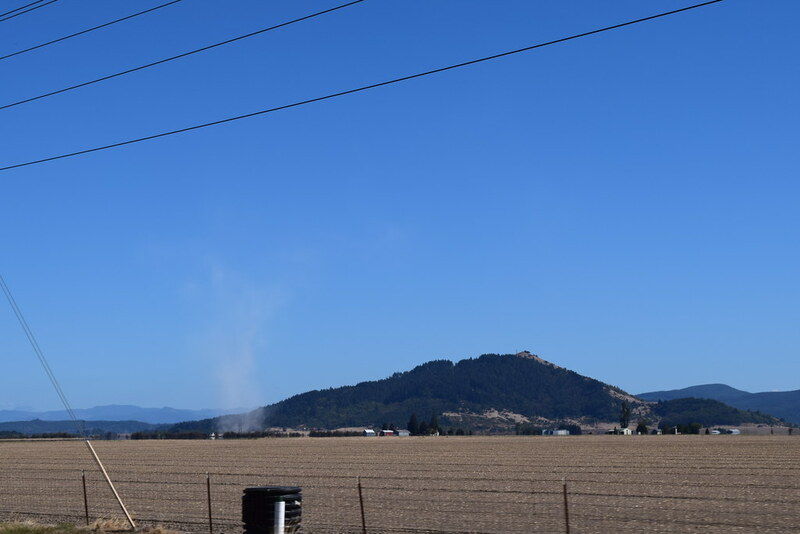 It turned out to be a ginormous dust devil – bigger than anything either of us had seen before. We enjoyed noting more dust devils (much smaller) as we drove. Alas, the picture doesn’t do it justice, as it had already started to dissipate by the time we got close enough to figure out what it was. We made what tracks we could, but having to stop to find me soft food, and then the doughnut errand, took time. We would have liked to get closer to Redwoods before stopping for the night, but lodging options that were also dog-friendly and relatively affordable were scarce. This is another case when I would have loved to camp for the night, but the bad, throbbing headache (that came back with full vengeance after the pain pills wore off, and I was reluctant to take more) and the badly aching mouth just made me miserable and not want to deal. 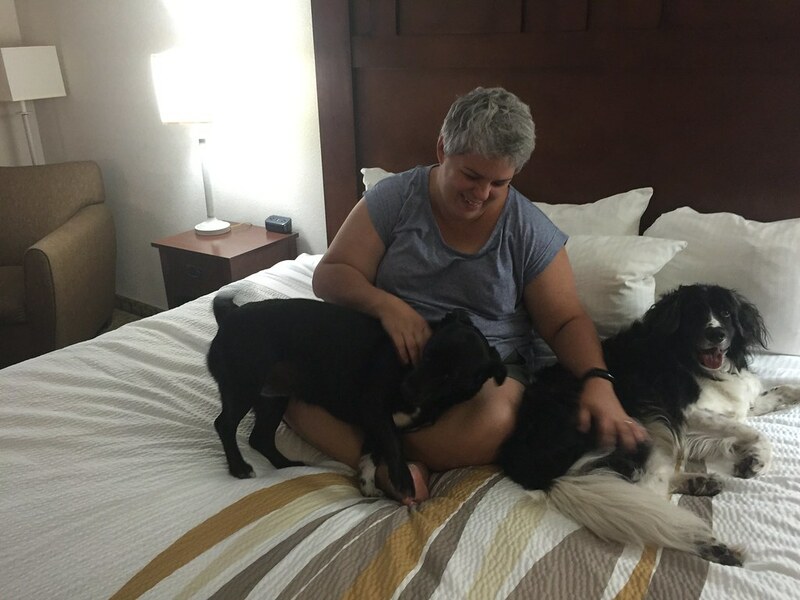 So we found a La Quinta in Grants Pass, where Kay dropped off me and the dogs before heading over to Wendy’s to grab me some soft foods. I managed to down some of their chili and french fries, but the chicken nuggets were too crispy for me to process with my achy teeths. Of course, the dogs required their requisite evening lovin’.